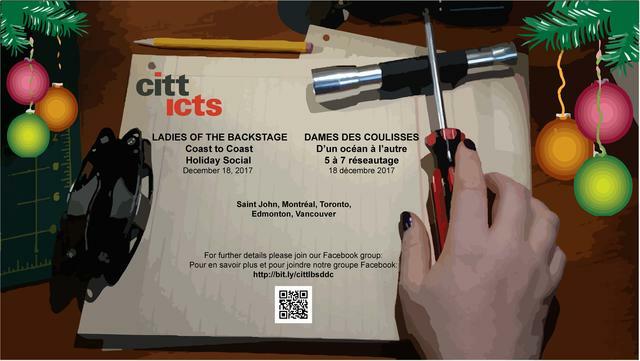 The newly created CITT/ICTS Ladies of the Backstage Committee is hosting its first event, the CITT/ICTS Ladies of the Backstage Coast to Coast Holiday Social. This event will be held on the same day in successive cities across Canada including Saint John NB, Montréal QC, Toronto ON, Edmonton AB, and Vancouver BC. 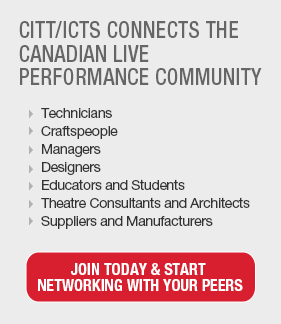 The CITT/ICTS Ladies of the Backstage Committee was created at CITT/ICTS Rendez-vous 2017 with the idea of supporting opportunities to examine challenges facing women in our industry, and to seek solutions. 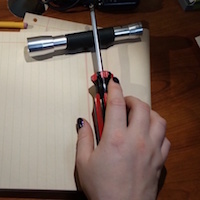 The committee focuses on networking, recruitment, retention, and career satisfaction. This social will be a time to come together to support each other, meet colleagues, share stories and spread some holiday cheer. All self-identifying as women are welcome, whether you are a CITT/ICTS member or not, so feel free to invite your female colleagues and friends from the industry, and join our Facebook group!